There aren’t too many times you get to watch Giselle with a jumbo bag of popcorn in your lap, but the Royal Ballet Cinema program run by promoter Fathom Events is making that combination possible, presenting broadcasts of live, real-time theatrical performances in movie theaters around the world. London’s Royal Opera House has joined with Fathom this year to present a selection of their regular ballet and opera seasons—so far the dance audience has seen their new production of Don Quixote staged by Carlos Acosta, Christopher Wheeldon’s Alice’s Adventures in Wonderland, and the ubiquitous Nutcracker. Giselle was next, in the Peter Wright production that has been in the Royal’s repertory for over 30 years. They’ll be finishing out their season with broadcasts of their Swan Lake and Sleeping Beauty, as well as the world premiere of Wheeldon’s version of Shakespeare’s The Winter’s Tale at the end of April. These programs have all the thrills and deficits that we’re accustomed to from the PBS Live from Lincoln Center broadcasts—we get a chance to see the company in their home theater, in a relatively unmediated performance. The cameras “sit” in parts of the theater that most of us cannot afford on a regular basis—indeed, in some cases, we see more detail than anyone else besides the performers themselves. But while the director sometimes makes choices that we wouldn’t make ourselves, about who to watch or how often to change our focus, the access these programs give us to artists and companies that we otherwise might never see more than makes up for the occasional foot that’s cropped out of the picture. The Royal’s Giselle sits very closely to what is known of the original choreography from the 1840s, and with Natalia Osipova and Carlos Acosta in the main roles we have dancers whose training has been focused on heritage works like this one. Originally trained in Cuba, Acosta has been affiliated with the Royal Ballet since 1998—Osipova came to the company in 2003 from Russia, where she had been a dancer with the Mikhailovsky and Bolshoi companies. While both of them approach Giselle from a traditional point of view, their performances are far from conservative. 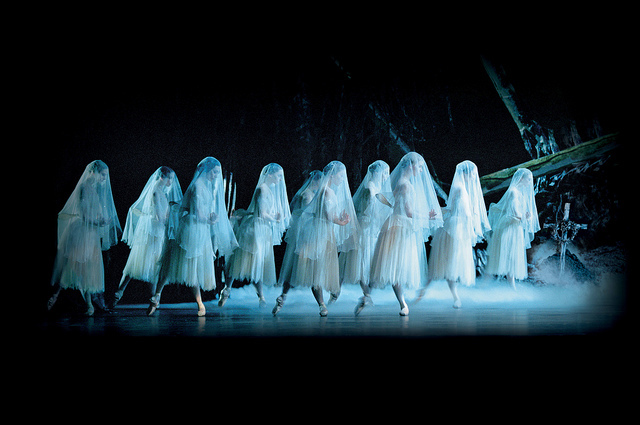 Giselle is often called the Hamlet of ballet – it’s arguably the most challenging dance and acting role in the repertory, and dancers compete to perform it. It’s also an amazingly coherent narrative, one where movement itself is a plot point, a metaphor, and an organizing principle. Giselle loves to dance and loves Alberecht—she expresses one love through the other, and when she is betrayed by the man, her other passion turns on her as well, becoming the means of her death. The first act alone provides enough material for several college essays, but the second act brings even more complexity, as the Wilis, spirits of young women who die before they marry, use dance to prey on hapless men who wander into the forest at night. 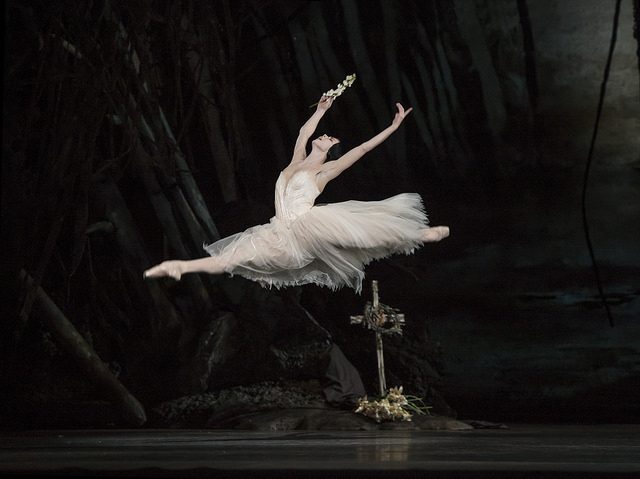 Giselle has been in continual production in Russia almost since Marius Petipa first staged it there in 1884, and Osipova’s performance shares the highly-refined elements of that history. Her Giselle carries that weight throughout her performance—from the moment she enters the stage in the first act we know she is doomed, and her hyper-agitated responses reinforce that impression. Osipova is already hearing the spirit world calling her just as clearly as she heard Albrecht knocking on her cottage door. Impulsive and shy by turns, she is baffled by his smooth manners —Acosta’s Albrecht carries his aristocratic heritage with him even when he’s dressed as a peasant. But while Giselle is charmed by his demeanor, her mother Berthe is wary; she doesn’t trust him at all. This production includes the full mime sequence where Berthe explains that young girls who die before their wedding day will be doomed to spend the rest of time as Wilis. It’s the key to understanding the set up for the second act and Deirdre Chapman was exceptionally clear and musical in her gesture language. But while Osipova is all febrile agitation as Giselle, Acosta almost twirls an invisible moustache—there are several moments in the first act where he plays Albrecht as an old-fashioned roué, toying with her ardor. It’s hard to convey his growing attachment to her within the confines of this choreography—she has much more scope for interpretation than he does. Osipova takes almost a naturalistic perspective on her character, while Acosta works in a slightly more formal fashion—there are a few moments of stylistic disjunction in their first act because of it. The second act is a much better balance for the two leads. She still has moments of wildness, but they’re tempered by death—she is able to forgive him and defend him from the Wilis, because she is not fully one of them yet. He is more direct and emotionally affective; they almost meet in the middle. The joint challenge in the second act is all about endurance, but it plays out differently for the two of them—she has to dance some of the most difficult allegro material in the classical repertory but look absolutely unphased during it, while he has sequence after sequence of big jumps that he must calibrate to look like he’s coming to the end of his life. Osipova has a very powerful jump and she really uses it to great effect in these scenes. During the Soviet era, Russian dancers frequently took Giselle’s solos very slowly, stretching out each yearning moment, but Osipova brings some of the hectic quality of her first act characterization to this act as well, accelerating through many of the extended phrases so that she bounds and rebounds. It is this sense of speed that underlines the fundamental tragedy of this work—what begins as a thrilling whirl loses all control when things begin to implode and fall apart—there’s no time for anyone to change the trajectory, or even brace themselves for the crash. The Royal Ballet Cinema program continues this week with the broadcasting of Sleeping Beauty at local cinemas on Thursday, February 20, at 7:00 PM. To win two tickets to the screening, follow the instructions below! Tickets and more info are also available here. Enter to win tickets to SWAN LAKE on Thursday, February 20th at 7:00 PM by sending an e-mail with subject line SWAN LAKE to SEATTLE@43KIX.COM with your name and number. Must enter by 12 PM on Wednesday, February 19th! Winners must arrive 10 minutes prior to redeem tickets at guest services for tickets to be valid. No purchase necessary. One entry per person. Winners will receive an email good for a pair of tickets by 3PM Thursday. Void where prohibited by law.